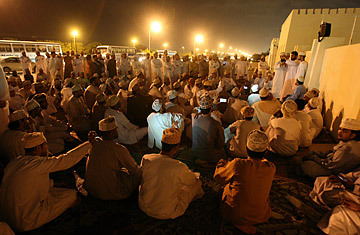 Omani protesters hold a sit-in outside the sultanate's consultative council in Muscat on March 1, 2011 to demand an end to corruption in the Gulf state. The two-dozen or so men sit around on thin pile-rugs under a traditional red woven Arabian tent with black motifs, just outside the high white walls of Oman's Majlis as-Shura, an elected advisory body to the country's longtime ruler, Sultan Qaboos bin Said al-Said. By nightfall they are joined by hundreds of men, women and children. Some of the men have been here since Sunday, when clashes with security forces elsewhere in this normally tranquil country  widely considered one of the most developed and stable in an unstable region  left as many as six anti-government protesters dead. But the brief spurt of bloodshed in the distant town of Sohar doesn't appear to have scared off tourists and other foreigners, many of whom are still lounging around on beaches that lap the warm Indian Ocean. Handwritten placards outside the Majlis as-Shura ripple in the breeze near the main tent, outlining the protesters' demands; "Yes to justice, no to corruption," reads one in English and Arabic. "We don't want this," another says in black ink, above several photos of a cramped, impoverished Omani home that could be anywhere in Egypt or rural Tunisia. But unlike the capitals of those countries, there is no police presence for the protesters here in Muscat, no soldiers or tanks, not even a guard outside the ornate black metal gates of the Majlis. In fact, several of the protest organizers are police and military. The only evidence of officialdom is a poster-size framed portrait of the Sultan; with his meticulously trimmed white beard, hands clasped in his lap, traditional dagger, or khanjar, tucked into his belt. Still, the calm at this sit-in, like that throughout Oman, is deceptive. There are very real grievances here, and concerns about the future of a hereditary monarchy with no heirs. In Sohar, an industrial town a two-hour drive from the Muscat, larger numbers are said to be still protesting, with perhaps more street action expected on Friday after prayers. Still, that seems very far from the capital. The rallying cry of youth-led protests elsewhere in the region, "the people demand the fall of the regime" has not been uttered here. The 70-year-old Sultan, despite being an absolute monarch who serves as his own prime minister, foreign, defense and finance minister, as well as governor of the central bank, is widely respected as a visionary for modernizing and transforming Oman during his 40-year-reign from a backwater perched at the tip of Arabia into an economic dynamo, diversifying away from oil toward tourism, industrialization and agriculture. But who will come after him? "Every citizen's fear is that there is no clear path for transition," says Zahran Zaher al-Ruqeishi, a protester and employee at the government-owned electricity utility. "Foreign investors also won't put their money in a country where they don't know what will happen with the transition of power." Several 4WDs slow down to stare at the protest camp set up along a main road just outside the airport, some of the vehicles carry military men in khaki uniforms with stars on their shoulders, others curious passersby. One stops to unload boxes of bottled water, donated by an anonymous private citizen. A man with a closely-trimmed black beard, strong jaw and green-embroidered kimma, a traditional round cap worn by Omani men, and a dishdasha gets out of a white Toyota sedan and walks toward the tent. He soon engages the group in heated debate. "What are you doing here?" he asks the men, several of whom are leaning against red cushions and sipping Arabian coffee out of paper cups. The list of demands, a handwritten copy of which is taped to a large blue board positioned near the Majlis gate, is explained to him. It includes the replacement of the current government with a transitional one ahead of elections, the formation of a national accountability board to combat and prosecute corrupt officials, the creation of a committee to write a constitution, job creation and more economic opportunities for all Omanis, the prosecution of members of the security forces responsible for the deaths of protesters, and prompt compensation to the families of the dead.